Turns out there is a right and wrong way to cleanse your face and despite the amount of energy we devote to our skincare regimens, when it comes to the first step, we don’t often give the same amount of care. We’ve outlined exactly how to wash your face by laying out 10 easy steps for a gentle, but thorough, cleansing. Cleansers should help clean and prep skin for active delivery of skincare ingredients from serums and creams. Opt for a mild, moisturizing cleanser that removes oil and residue without leaving your skin dry, tight, or flaky. Wash your hands thoroughly before you begin washing your face. You don’t want all the bacteria from your hands to transfer onto your face. Rinsing your face with cool water to close your pores is just a myth; water that is too hot or too cold will only shock and irritate skin, causing broken capillaries. Never apply cleanser directly without moistening your face first. Most cleansers are too harsh and need to be diluted with water. Use one pump of product and create a lather with your fingertips first. Apply using a gentle, circular motion to loosen dirt. Residual products will dry out your skin and clog pores. Keep rinsing until all the cleanser is removed from your skin. Don’t forget to rinse your hairline, neck, and the sides of your nose. These are places often missed and can lead to skin irritations. exfoliating can be a bad thing. 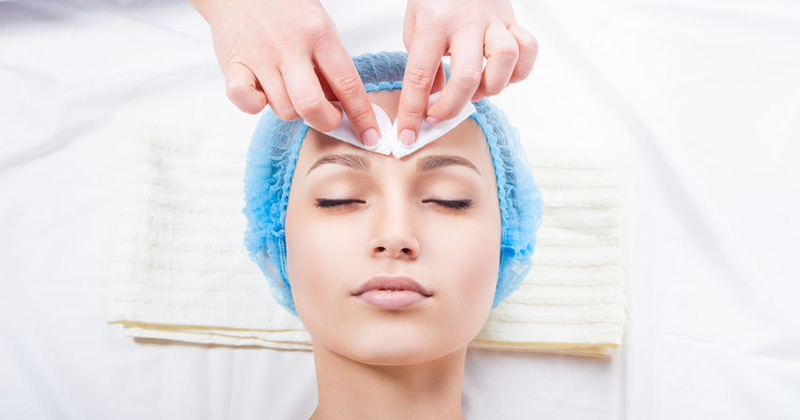 Acids and buffing agents are meant to smooth skin by removing dead skin cells, but exfoliate too often and you run the risk of stripping and drying out the new layer. Over time, this will weaken the skin’s natural barrier. Fingertips are always best, but if you must use a washcloth, make sure it’s clean, and never rub. The skin on your face is delicate, and rubbing too harshly with a towel can lead to abrasion and wrinkles over the years. While your skin is still damp, apply a moisturizer to seal the moisture balance before your water evaporates off the skin’s surface. Washing your face 2-3 times a day is healthy, but over cleansing will disrupt natural barrier functions and can actually make conditions like acne and rosacea worse. Never go to sleep without a proper facial cleanse. Skin pollutants left overnight can cause seborrheic dermatitis, overnight yeast buildup that results in redness and scaling. Now that you’ve read our tips about how to wash your face, it’s time to get your skin seriously glowing! Book your new patient consultation at Mary Lee Amerian M.D. Dermatology today for your skin care assessment. Dr. Anterasian, a board-certified dermatologist with a clinical practice in Santa Monica, shares his top 10 techniques for how to wash your face.